One fifth of the country has been affected by the recent floods in Pakistan and 20 million people need our support. Apart from individuals, I am thankful to all the organizations that I am associated with who stood by my side and are doing whatever they can. The first question that came to our mind was “What is the immediate need of the victims that we have to address?” The obvious answer was food and water. There is water everywhere but none safe to drink. Outbreaks of cholera are common in large floods and arranging safe drinking water to many millions of people is of extreme importance. Hence we decided to look out for water solutions as it is not possible to deliver mineral water everywhere. Last year I saw the following talk amongst the TEDGlobal 2009 videos where Engineer Michael Pritchard introduced his revolutionary product “Life Saver Bottle”. I was still wondering that how can we use the same idea here that we received an email from Mr. Azhar Mateen who told us about a similar system that they have developed in Pakistan. Instead of bottle, it is more of a manual filtration plant. The plant is capable to treat the flood water directly and its capacity is more than 1000 liters per hour. Since electricity is not available in the affected areas, the system is capable to run without electricity. He further told us that they are donating 10 plants for free and can provide us similar system on no profit no loss basis for only PKR 250,000 whereas such a system would cost much more if we’ll try to import it. The company behind the project is Tauseef Water owned by Mr.Tauseef Anjum of Tauseef Enterprises Ltd. The following video is the live demo of the working system. 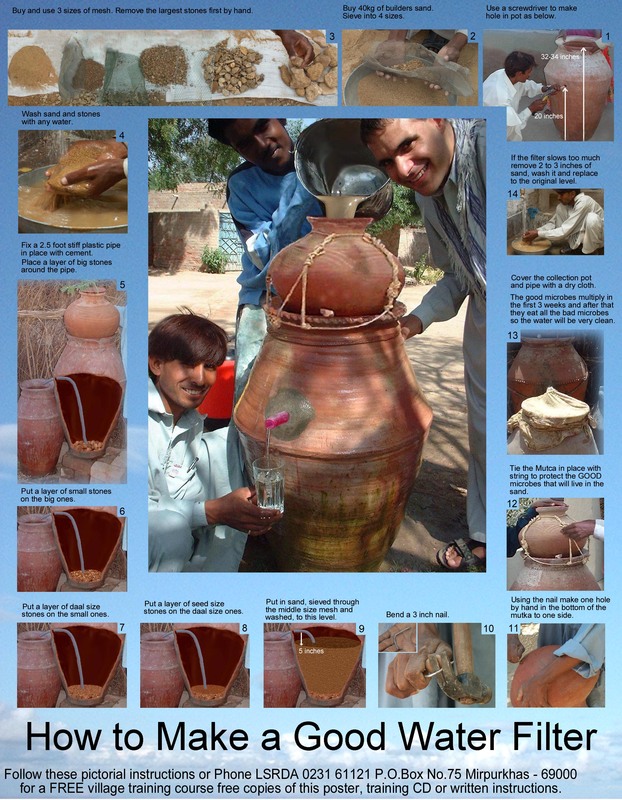 Moreover, a friend emailed me the following poster which showed steps of making a good sand water filter. Additional details about this can be downloaded from here. I somewhat felt really happy that people are coming up with amazing ideas to help out their fellow countrymen. Burt Rutan once said that “Innovation occurs in periods of adversity”. I would request all readers to step up and come out with such innovative solutions & initiatives that can be used to help our brothers and sisters. Since we have to rebuild these areas, smart relief efforts and superior infrastructural & residential planning is the need of the hour. In the waters of the devastation hitting Pakistan lies a chance to reinvent our condition by washing away the regrets of the last 63 years and laying the foundations of a new temple. But only if we have the courage and vision to think on these lines. excellent idea, we were already working on these lines. Rafaeel, innovation and … character as in sincerity, integrity, etc.